Healthy Mango Smoothie Bowl Recipe is a perfectly delicious way to start your day. Get your creative juices flowing and decorate your bowl as you like. Here is how to make Mango Smoothie Bowl. Who doesn’t love mangoes right? Mangoes are full of tropical goodness and it’s the perfect fruit to have in the form of a decadent healthy smoothie. Given that the latest trend of making a delicious smoothie and topping it with healthy toppings has taken the world by storm, I’ve decided that what could be better than a smoothie, but a smoothie bowl to start my day. Smoothies are a great way of incorporating much needed nutrients in our diet, some of the other smoothie recipes I’ve posted are: Healthy Banana Mango Green Smoothie, Easy Healthy Black Forest Smoothie, Vegan Peach Mango Smoothie, Peach Oats Smoothie Bowl, Pumpkin Pie Smoothie, Pear Ginger Green Smoothie and Strawberry Colada Smoothie. Mangoes are full of goodness and an excellent source of Vitamin A, beta-carotene and potassium. 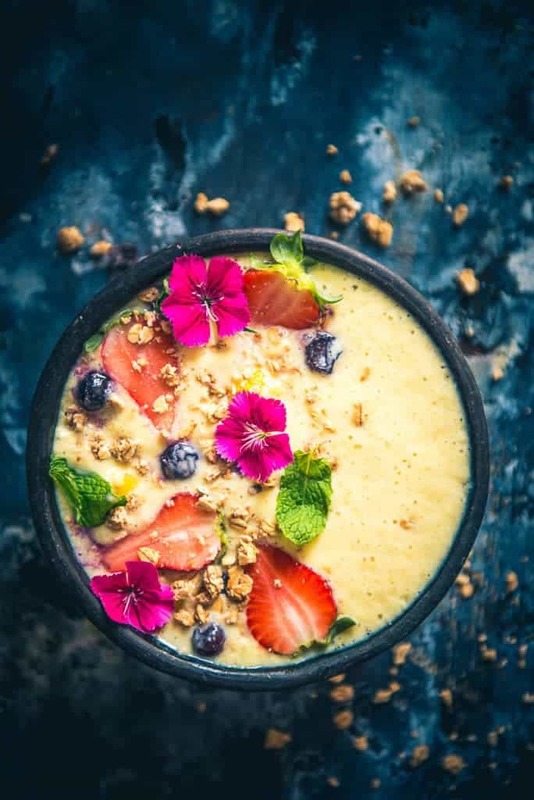 They also provide nutrients like Vitamin B6, Vitamin C and Vitamin E.
To make this delicious Mango Smoothie Bowl Recipe, peeled, cubed and frozen mangoes, peeled and frozen bananas, yoghurt, milk and coconut water are added in a blender and mixed until completely blended. It’s best to use frozen fruits for smoothies as it gives the smoothie a creamy texture and it blends really well. The smoothie is then poured into serving bowl. Unlock your creative side and decorate the smoothie bowl using toppings like fresh blueberry, mango slices, banana slices, coconut flakes and chia seeds. It’s best when smoothies are served immediately as all the nutrient contents of the fruits are intact. 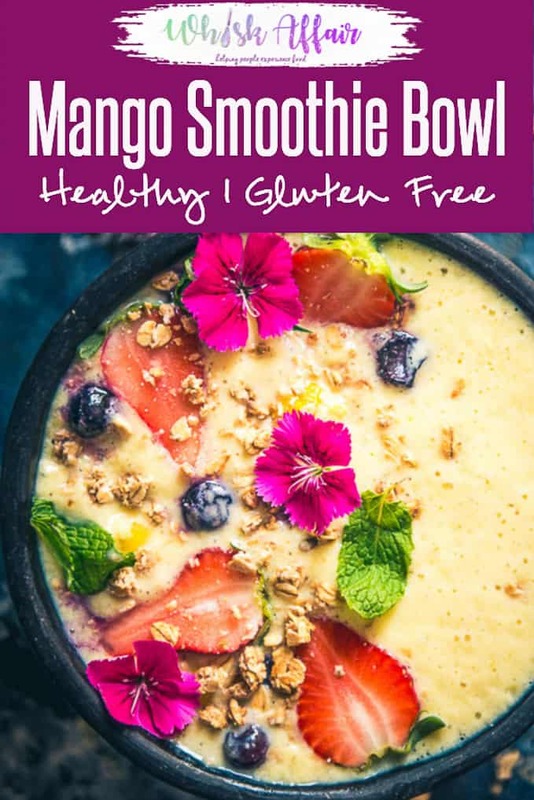 This mango smoothie bowl makes for a delicious and exciting breakfast; there is something satisfying about slurping this smoothie out of a bowl. The beautiful presentation of the smoothie bowl adds just the needed oomph to your day or meal and keeps you prepared to take on the day ahead. 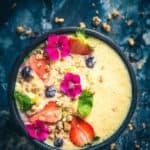 The best part about smoothie bowls is that you can use your favourite topping to make your smoothie look absolutely delightful, if you have kids in the house, you could also get them to decorate their own smoothie bowl and they are going to love it even more. Here is how to make Mango Smoothie Bowl Recipe. Healthy Mango Smoothie Bowl Recipe is a perfectly delicious way to start your day. Get your creative juices flowing and decorate your bowl as you like. Add mango, banana, yogurt, milk and coconut water in a blender. Pour the smoothie in serving bowl. Garnish with blueberry, mango slices, banana slices, coconut flakes and chia seeds. You might also like these smoothie bowl recipes.